Doodlecraft: Star Wars GALAXY Drip Cake with Luster Dust! Star Wars GALAXY Drip Cake with Luster Dust! Make an adorable layer cake for a fantastic Star Wars geek party. We are celebrating this weekend with a party and everything Star Wars. It's a fun break from the red and green of Christmas! This gooey fudge is the perfect topping for a drip cake and perfect using the darkest chocolate, to give it a nearly black color! This cake pan set is perfection. It has five 6-inch trays that hold exactly one cake mix box worth of cake and make the stage for the perfect layered cake. Begin the fun by mixing up your cake mix and separating into cake pans. They all fit and bake in the oven at the same time. Genius! Let your cakes cool or even freeze. I cut the tops off the cakes before I froze, so they would be easy to stack straight. Add a little frosting right to the cake stand. Then add a cake, add a layer of frosting, add cake, etc. I did super thin layers because I am not a huge frosting fan. You could fill the layers with cream, jam, or a thick layer of frosting. Continue the process until you get to the top. Finally add the last cake on top! At this point you can add thick full frosting all over the cake, or give it a "naked" look with barely any frosting scraped around the sides. I prefer less frosting, but it also shows any cake imperfections. Now, on the stove, mix up your Fudge. I don't use a thermometer, I do it the old fashioned way of dripping some in a cup of cold water to see if it forms a ball. Once it's hot enough, pour it out on a platter too cool. Don't touch it. After the fudge has cooled, get a spoon and stir it vigorously. Add in a pinch of salt and a 1/4 tsp of vanilla. Stir stir stir, until smooth and creamy. Then pour it right on the top of the cake stack. Right in the center. It will be soft enough to move and drip. And if the fudge was timed just right, it will not drip all over the place. Let the fudge set and "glass" over. 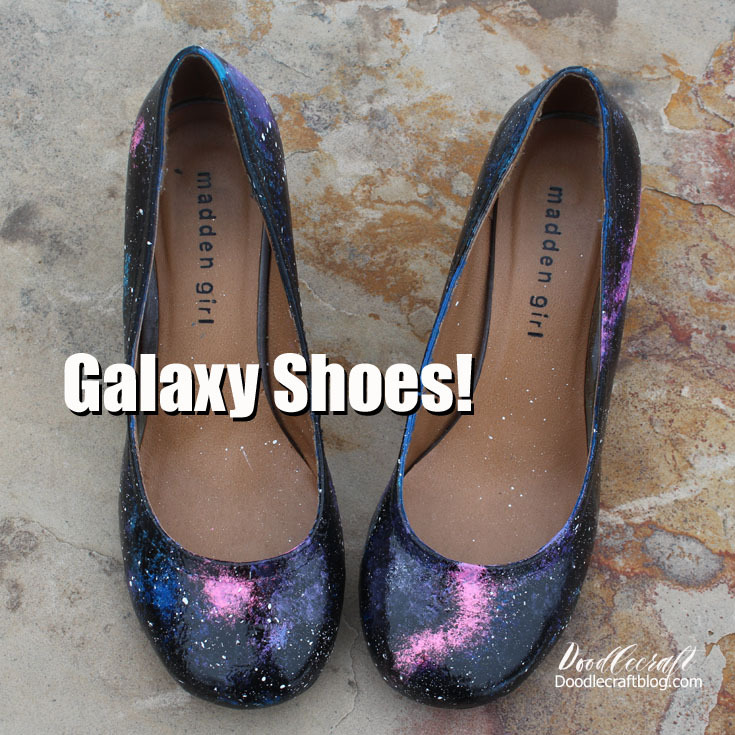 Then use the clean paintbrush and the luster dust to add galactic details to the galaxy cake. If I had more colors of dust I would use them, but I just had blue and white. Add some nebulas in a diagonal line across the top of the cake. Then add white luster dust stars. Fill the brush with luster dust then hold the paintbrush about 6 inches above the cake and tap the brush with your other hand. It will sprinkle a beautiful layer of stars all over your cake. You can buy luster dust at the craft store in the baking aisle. If you don't have any, you could improvise with a little powdered sugar in a sifter. In the right light, the luster dust shimmers like glitter! I love how this galaxy cake turned out. It almost has a glossy mirrored finish too. It is perfection! A great cake for your Star Wars debut party! Check out my full party here! 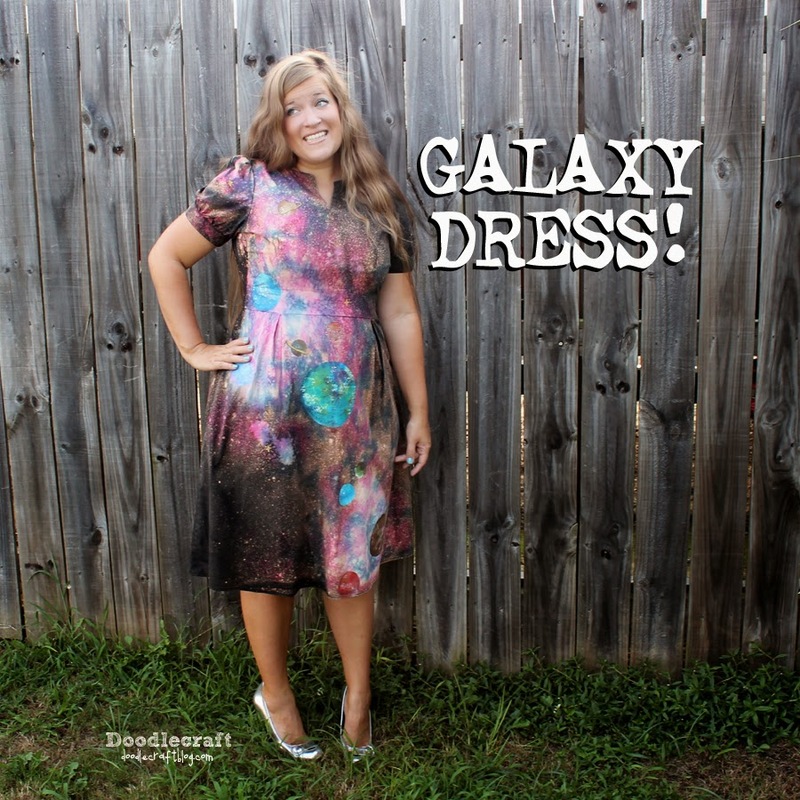 Here's some more fun Galaxy inspired crafts!